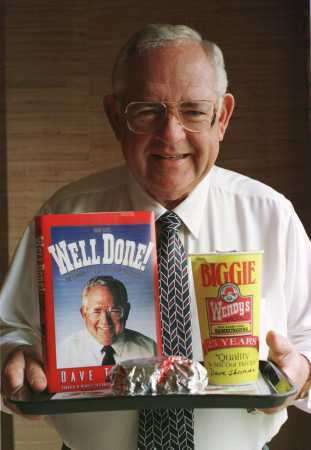 Today I found out that Dave Thomas, the founder of Wendy’s, before starting the Wendy’s franchise helped save the KFC franchise and was a high school dropout. Thomas first worked at a Knoxville restaurant at the young age of 12 years old, from which he was eventually fired due to a misunderstanding with his boss about a vacation. At 15, he worked at a Hobby House Restaurant in Ft. Wayne. His father and step-family, at that time, were moving, but he decided to drop out of high school and stay in Ft. Wayne. He then moved into the YMCA and started working full time at the Hobby House. This worked out for him as, through his job at the Hobby House Restaurant, he met none other than Colonel Sanders himself, the founder of Kentucky Fried Chicken, who later became his mentor. Many years later, after a stint in the Korean war as a cook in the army for which he volunteered, in 1962, Thomas invested in and was placed in a managerial position over four of Colonel Sanders’ KFC’s that were failing. He saw that one of the problems with KFC, and all fast food restaurants of the day, was that they had much too complicated menus. He then worked with Colonel Sanders to drastically simplify the menus, focusing on a few signature meals. This small change particularly helped turn around the KFC franchise; and, though it was a minor thing, helped revolutionize fast food restaurant menus all over the world. Even to this day, the staple of most fast food restaurants is their overly simplistic menus, focusing on a handful of signature meals. After he had turned these failing KFC restaurants around, he then sold his stake in them back to Colonel Sanders for a significant profit over what he originally paid, receiving $1.5 million in the sale. He then took this money and invested it by opening the first “Wendy’s Old Fashioned Hamburgers” on November 15, 1969; the restaurant being named after his fourth child, Melinda Lou Thomas. You might be asking yourself, “How do you get ‘Wendy’ out of Melinda Lou Thomas?” This was a nickname given to her as she couldn’t pronounce her own name when she was young, instead she would say “Wenda”, which is how she got the nickname Wendy and how the restaurant got its name. 6000 restaurants later, Wendy’s is now the third largest “hamburger” fast food restaurant in the world with annual revenue of about 7 billion dollars, lagging behind Burger King (12,000 restaurants), and McDonald’s (31,000 restaurants). As a child, his favorite restaurant was Kewpee Hamburgers, the second ever chain of hamburger fast-food restaurants. Their staple items were square hamburgers and thick malt milkshakes, much like Wendy’s. Thomas also is the one who introduced the KFC trademark sign featuring a revolving red-striped bucket of chicken. He was the first to successfully implement a drive through pickup in a restaurant, which is of course, now used by all fast food restaurants. Wendy’s was also the first to successfully create a “fast food” style restaurant that didn’t pre-cook its food nor used pre-made frozen items. He credits his ability to do this with knowledge gained in cooking for over 2000 soldiers daily while in the army. Thomas never met or knew who his biological parents were, other than that they were of Greek descent and that his biological mother was single and dirt poor due to the Great Depression. Thomas was a Freemason, member of the Shriners, and an honorary Kentucky Colonel. Realizing that his success as a high school dropout might convince other teenagers to quit school (something he later admitted was one of his life’s greatest mistakes), he became a student at Coconut Creek High School and in 1993 received his G.E.D. being voted by his classmates as “most likely to succeed”. Being adopted himself, he founded the Dave Thomas Foundation for Adoption to help children find homes and help them and their new families afterward. In 1979, Thomas’ rags-to-riches story earned him the Horatio Alger Award from the Horatio Alger Association of Distinguished Americans. On the death of “Colonel” Harland Sanders, Kentucky Fried Chicken’s founder and a mentor of his, Dave Thomas ordered that all flags at Wendy’s franchises be flown at half-staff. Thomas died January 8th, 2002 after a decade long battle with liver cancer. Thomas was awarded the Presidential Medal of Freedom in 2003. That was great of you to write abot Dave Thomas. He was a great person in many ways. He helped so many People with jobs and charities. Many people had so much respect for him. As soon as I read the title I knew I was going to have to respond…. My brother is very close with the family who owned the restaurant where he was employed in Ft. Wayne. I know a few of the grandkids who he is very good friends with and they took it upon themselves to look back into the old employee log books. The Frosty that Wendy’s is so famous for is actually from these restaurants in Ft. Wayne (Hall’s Restaurants). Jake–And you point is ?????????????????? That should be “due to” the Great Depression. To my recollection that’s a very accurate story. I had the pleasure of knowing Mr Herb Weingarten Who was known at the time as Mr Drive-In. He was the president of his company Servicephone which was the main supplier of phone speakers to drive in movie theaters and Drive-In restaurants like Dave Thomas mentioned as a matter of fact he and Dave Thomas and their wives were out for dinner the night she went into labor with Wendy. Herb was the man who encouraged Dave to venture out of KFC and open a hamburger fast food restaurant. Herb was also the inventor of the signage you still see today at a typical fast food establishment. He was also friends with Wynn Marriott who owned the Frisch Big Boy franchises.